So, the Equilink DU bushings and axles were included in the refurbishment kit I bought apparently. Not sure if the shop who did the work actually replaced them however ! So, I have new DU bushings and new Acetal thrust washers (plastic spacer thingy's) on order. I decided to 'bodge' it so I could ride today. So Thursday night after work, I stripped the whole rear suspension down to get the Equilink 'bone' out, and see what I could do. 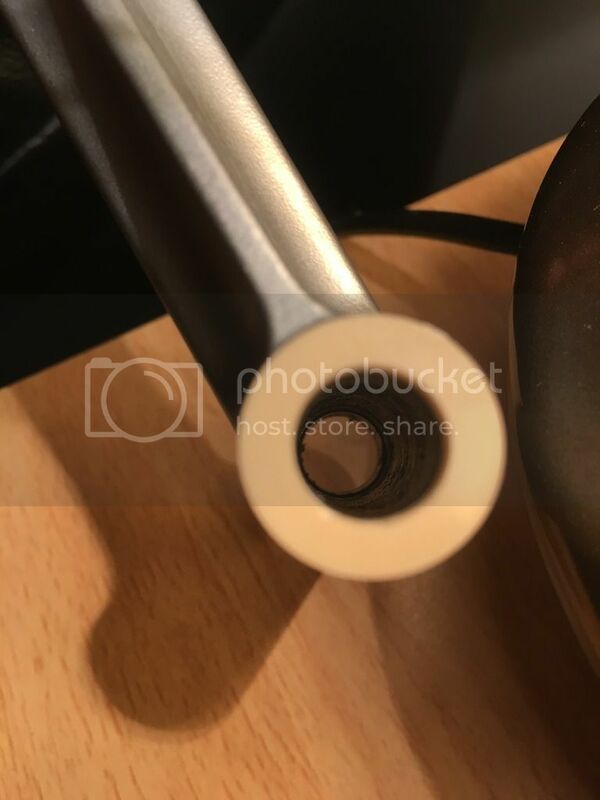 I noticed where the movement was, there was a significant gap, where the plastic spacers are, allowing the whole 'bone' to move left/right and obviously causing the creak. So I stripped everything down, cleaned & greased the axle/bushings, then put a couple of metal washers which were just the right size to fit over the Equilink pivot axles. 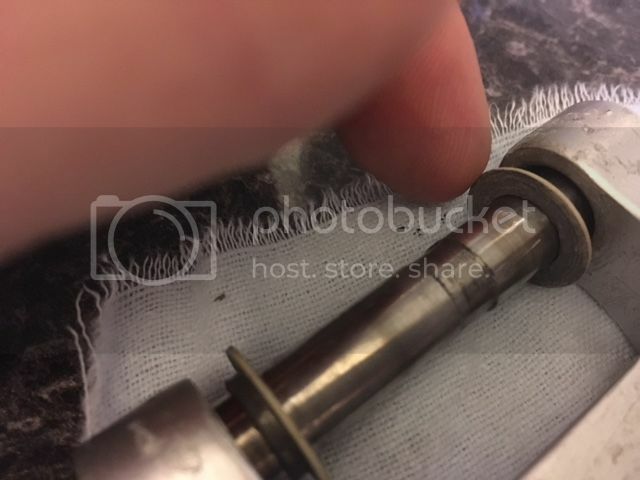 These sat up against the metal housings to the DU bushings, and the plastic spacer thingy's sat against the metal washers. The result of this was an Equilink with ZERO movement, and super smooth action. In fact, the back end feels better now than when the bike was brand new !!!! It was a transformation seriously, and I felt more confidence riding it, could not believe the difference. 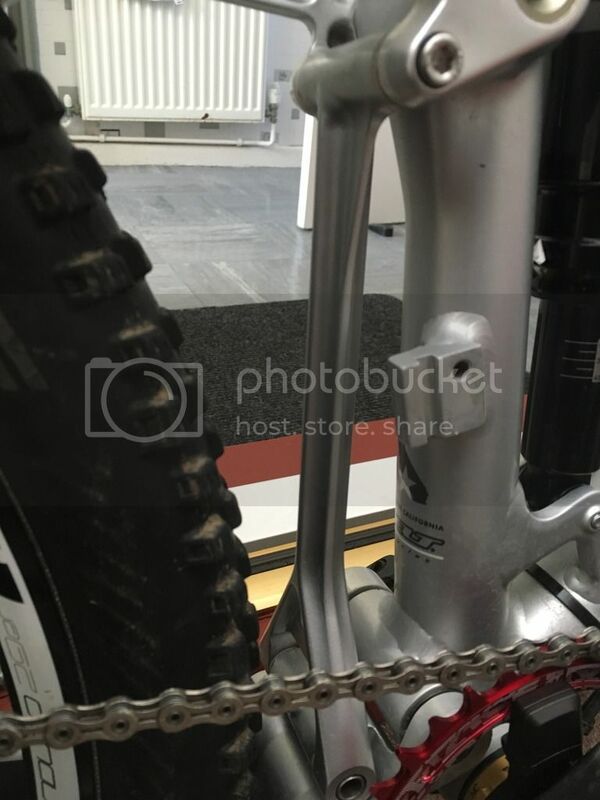 I honestly did not think this small 'extra' part of the suspension (which is independent to the rear chainstay/seatstay swingarms) could make such a difference to the overall suspension feeling, but it does. 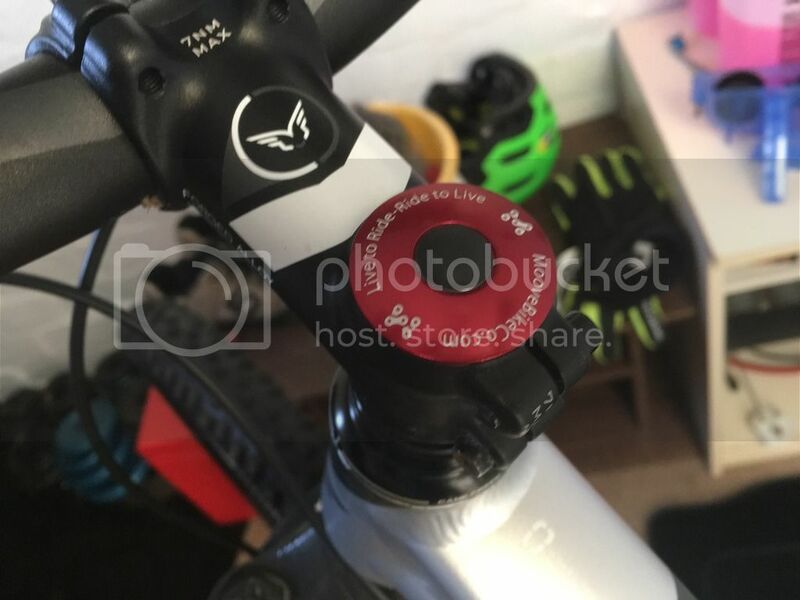 So, if you have a similar bike, and feel it is a bit creaky or loose, it may not actually be your suspension as such, but this Equilink part that is causing it. 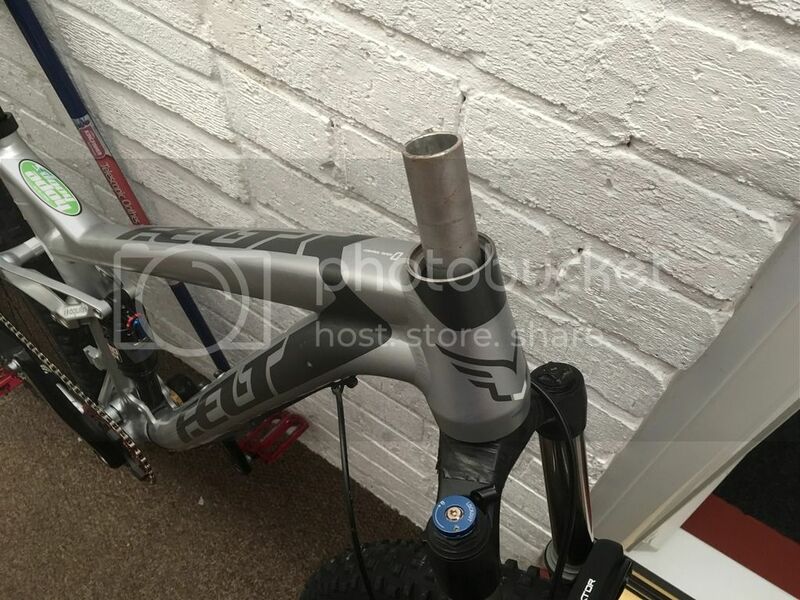 And here you can see where this Equilink bone sits, behind the seat tube. It's apparently Felt's way of stopping pedal-bob, although I don't see many other bikes with such a system and they seem to ride fine. Saying that I get zero pedal-bob so it must work. I had a half day off work today, so decided to fit the new DU Bushings & acetal thrust washers to my equilink. 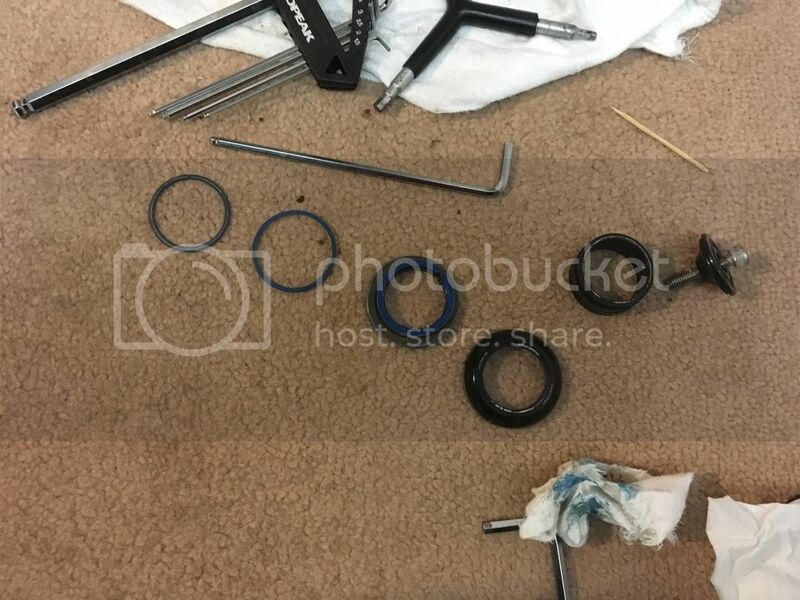 If I had known it was going to take me about 2 hours of fiddling, swearing, and using a variety of washers, bolts, and random bits I had in the shed just to allow me to actually get them out (even WITH the FELT tool kit), I think I might have just got my LBS to do it. I am not joking, it was a proper PITA to get the DU Bushings out, although the new ones went in very easily. 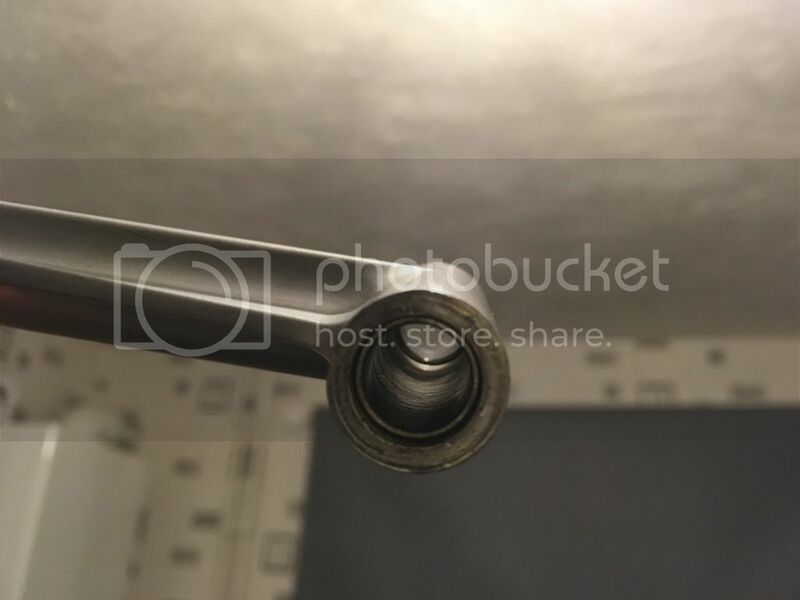 Hopefully you can just about see the shiny bushings inside the shaft, it was difficult to photograph. 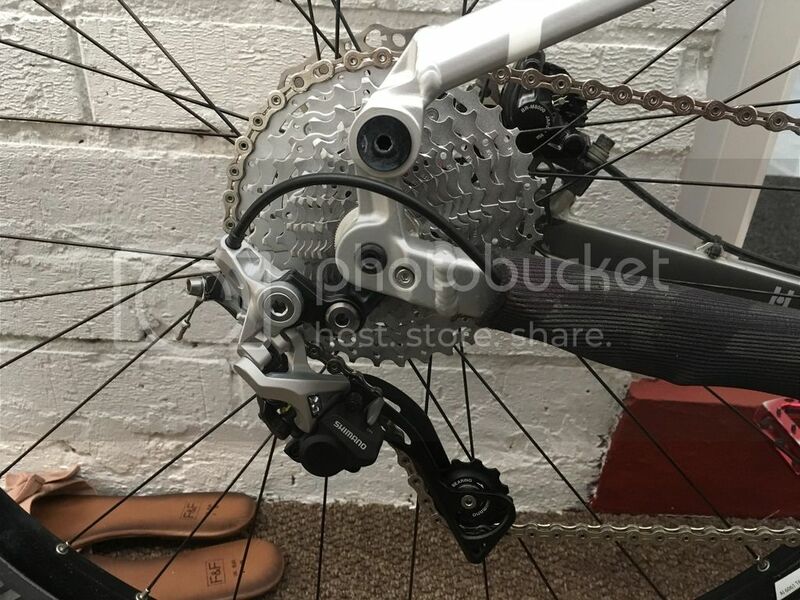 Also fitted new Cassette (XT 11-36 10sp), Chain (KMC X10 silver), Chainring (RaceFace n/w 34t), and rear derailleur (XT medium cage). Should see me for a few months, although the sidewalls to my Nobby Nic's are showing a bit of wear, might have to replace for peace of mind, even though the tread is still good. Spent a couple of hours putting things back together this afternoon. Suspension back together, with the damn 'equilink' bone part, containing the fiddly-to-fit bushings, re-assembled, along with the back of the bike. Everything feels 'plush' again, no 'play' or movement sideways or anything loose/knocking, suspension feels like new. New chainring fitted, new chain fitted, and crankset back on the bike. And finally, new cassette fitted to back wheel, and new rear derailleur fitted. Well, I am now into my 3rd year with this bike, and I have to say, it is brilliant. 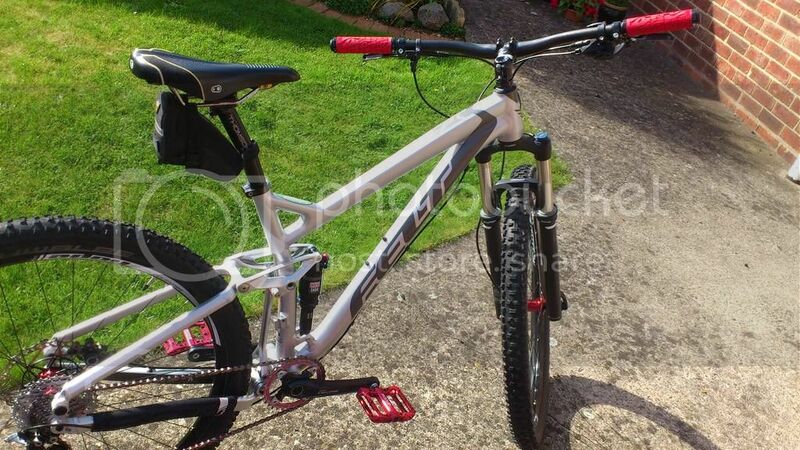 Unless I came into some money to buy outright, a new YT Jeffsy, then there isn't much else out there in my budget that I would rather have than this Virtue 50. 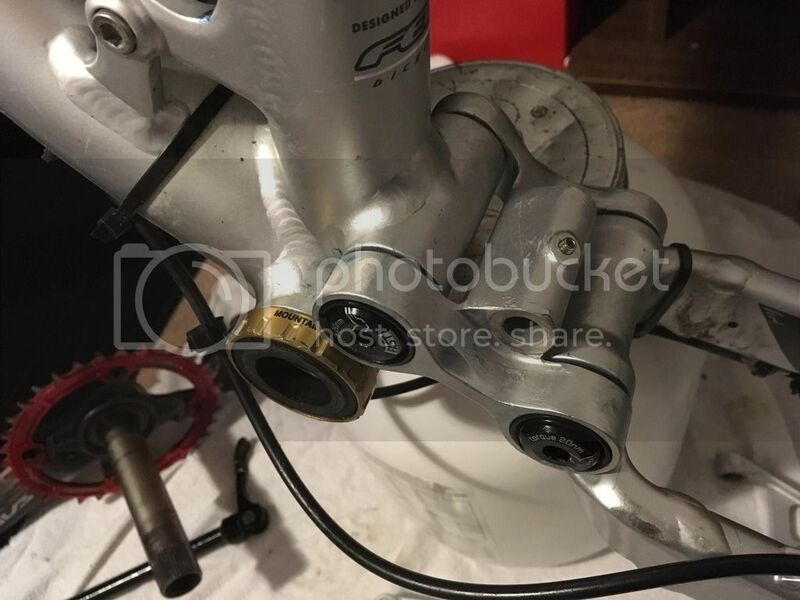 The bad points about this bike, are the equilink bushings. The equilink is a fantastic system for reducing pedal bob, in fact, it eliminates it. The downside is, the bushings only last a few months, and they are a PITA to replace ! I had a new bearings/bushings/bolts kit sat here ready to use, along with the felt tool kit, and have been putting it off, but after last weeks clonking noises constantly coming from the equilink bushings, it could not wait any longer. So, stripped the bike down in my tiny brick shed, and got to work. 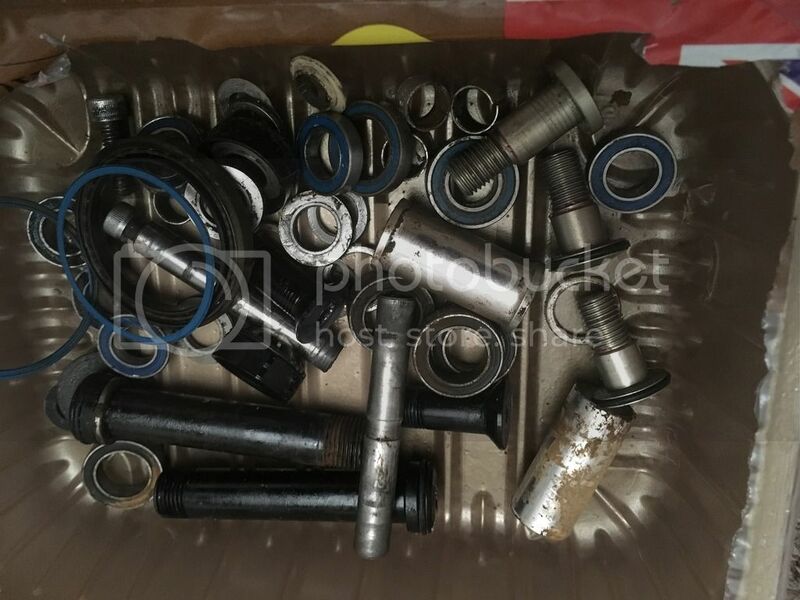 Box of bearings, washers, O-rings, spacers, bolts, etc ..... and big breath ..... go to work. 2 hours on Tuesday night, 2 hours on Thursday night, and 3 hours today and it's done, along with headset bottom bearing (cane creek 40 series one, was absolutely destroyed after only 6 months). The bushings in the equilink are such a pain, and take ages to do each one. 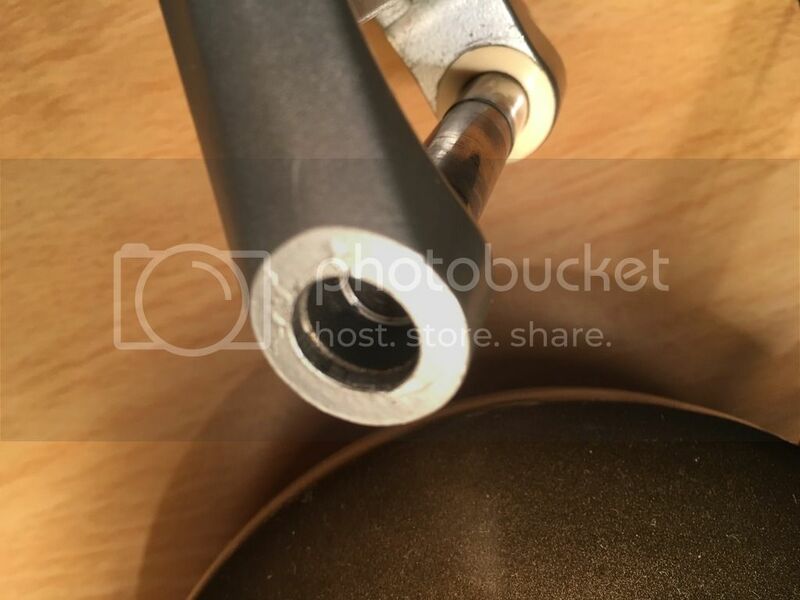 First, a split tube with a lip on the end has to be compressed and pushed into the bushing, so that the lip slips behind the inner edge of the bushing. 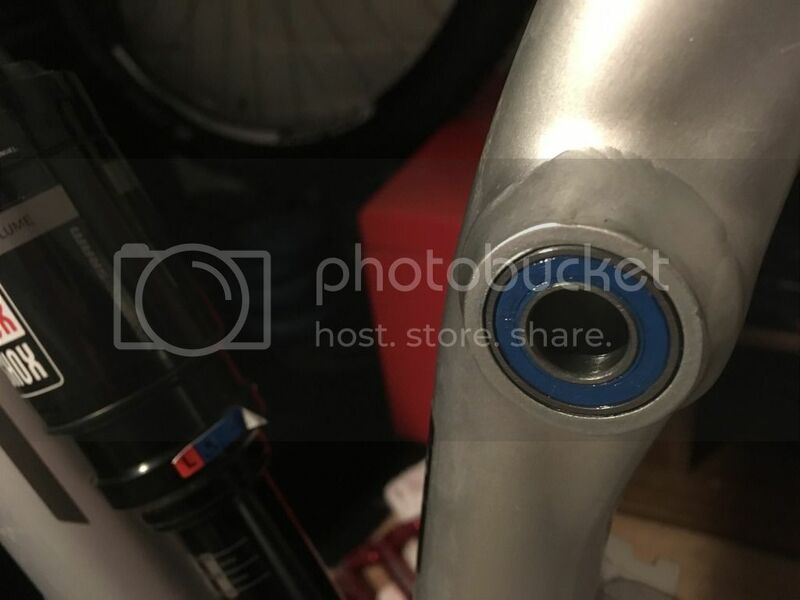 Then you setup the bolt with a wedge which opens the split tube so the lip cannot slip inside the bushing, and stays gripped to the rear edge of it. This goes through the whole thing, and a cup and nut on the other end. 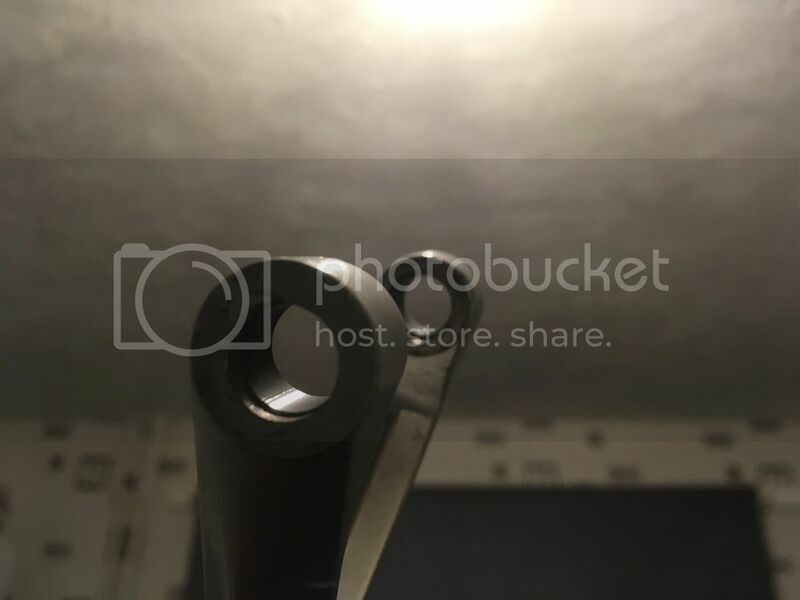 Tighten the bolt/nut with allen keys, and hopefully the lip of the split tube doesn't slip inside the bushing, and it manages to draw the bushing out. Swear a lot, and after a few attempts it manages to work. 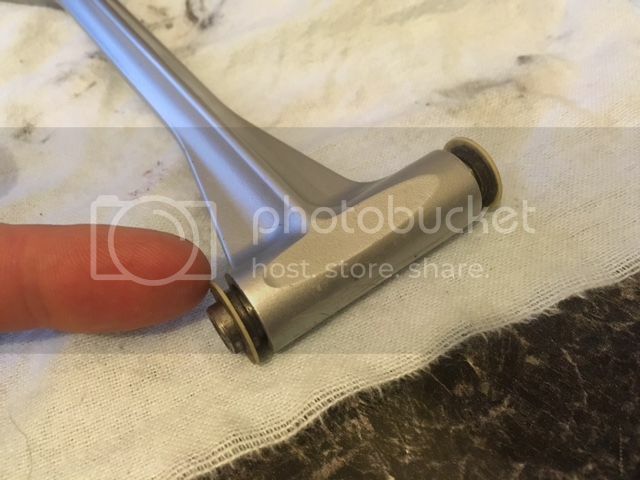 The bearings are slightly easier, if only because there is more of a lip for the tool to grab. Still time consuming and fiddly, but not quite the pita that the bushings are. New top bearings in, halfway down the seat-tube. And four (two each side) new bearings in the bottom pivots, behind those black bolts. 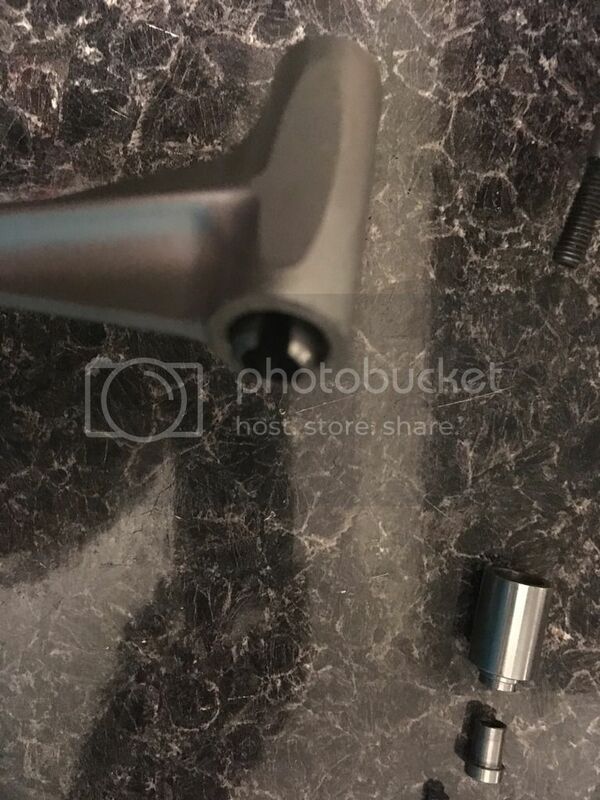 You can see the hole in the middle of this part, where the bottom of the equilink fits. 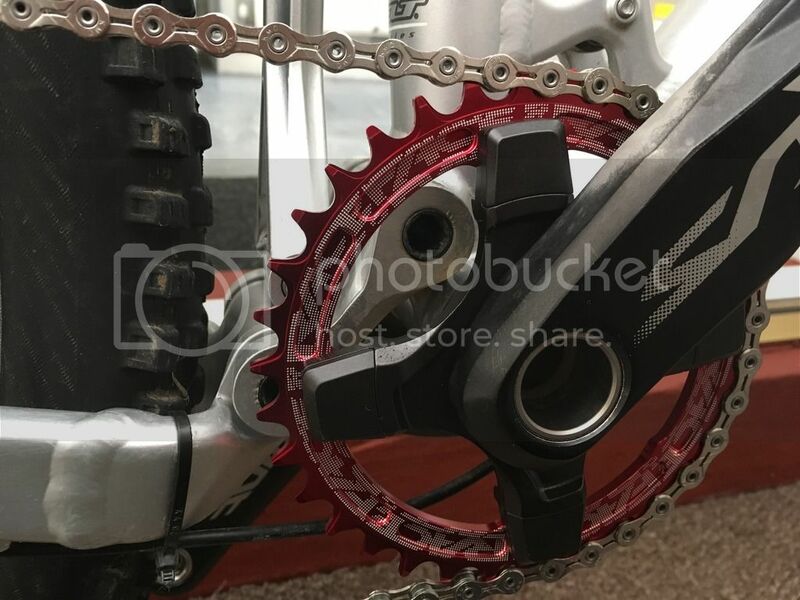 There are another four bearings in the pivot where the chain stays & seat stays meet the rear wheel, those are slightly smaller but two each side with a washer in the middle, tricky to get the damn tool to grip the rear edge. 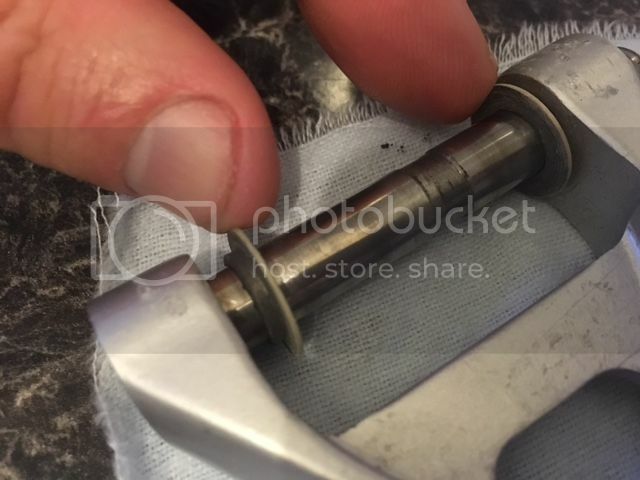 Top bearing was ok, just picked the seals off it, flushed with degreaser, rinsed with water, dried out on the fire, then re-greased with park tools high performance grease. But bottom bearing was absolutely destroyed. It was rusty as hell, and came apart in two when I removed it from the cup. So, luckily my LBS had one in stock, £14.99, so off I went, fetched it and fitted it, phew all done. You can see the kaput bottom bearing in the box of bits below, crazy how knackered it was. So, all these bits were replaced, and quick ride to make sure everything is tightened, ready for Dalby tomorrow !!! 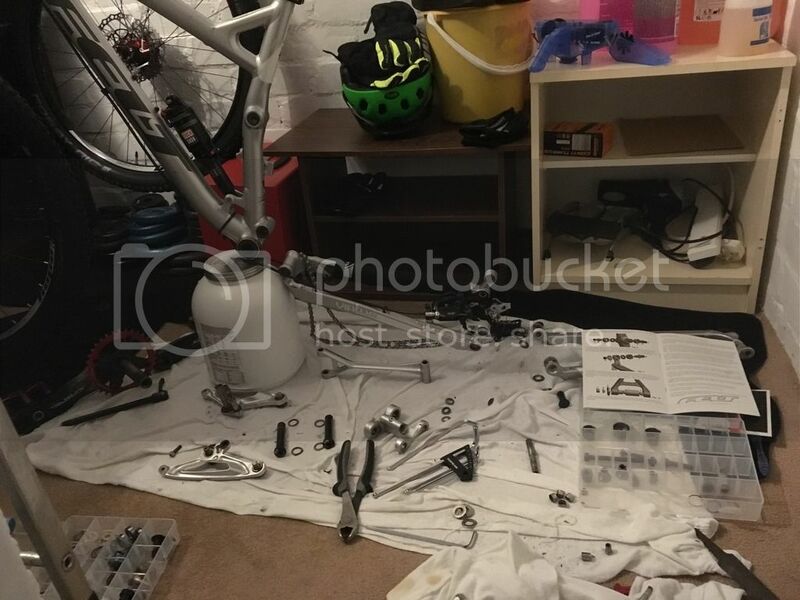 My LBS charge about £60 labour to replace what I have done myself, and to be fair, even in a large workshop, with a proper bike stand and metal tray to catch all the bits, and top quality tools, it must take them a good 2 hours to do. So, it is good value really, and doing it yourself in a tiny shed, is really quite frustrating and difficult. Fingers crossed I have assembled it all correctly, and tightened everything up !!! Bike was a dream today at Dalby, not a single click, creak, or knock, silent ! I guess my tightening of the pivot bolts by hand (I don't have a torque wrench) was about right, nothing came loose. Well done, you must feel pretty ruddy satisfied. 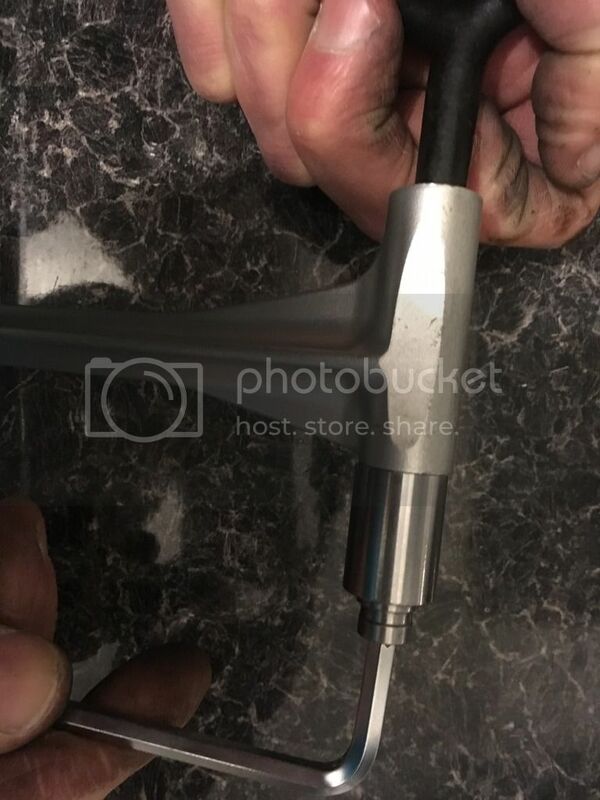 If your going to those extents of home maintenance its worth getting a torque wrench, its just a bit more feeling of satisfaction knowing everything is done to factory specifications. The money you saved in labour at the LBS would more than cover the cost. I've got a Teng one which has a really nice range for almost everything you find on a bike its 5-25Nm IIRC. 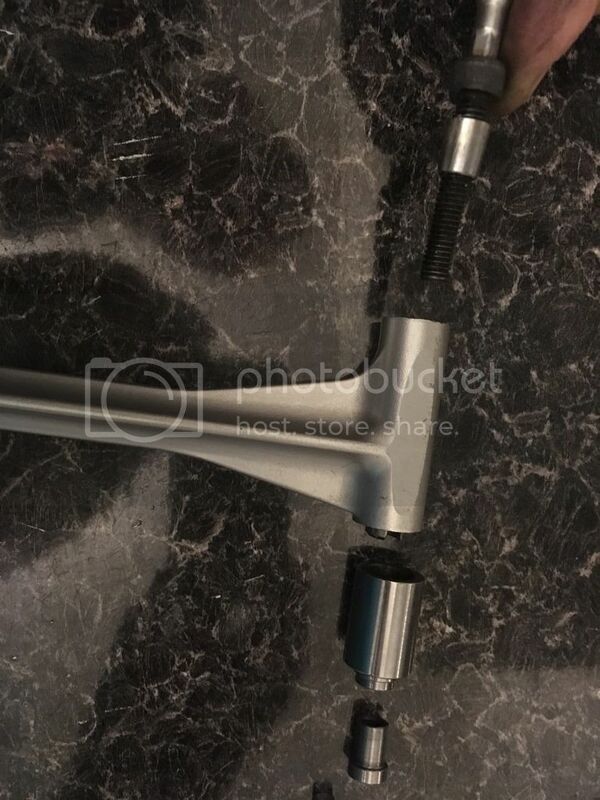 @ Gunner : Thanks m8y, it is a bit of hassle but I know the bearings have been packed with good quality grease now ! @ Rob : Yes that's a good idea, and when funds allow I think I will buy one to add to my growing tools kit. 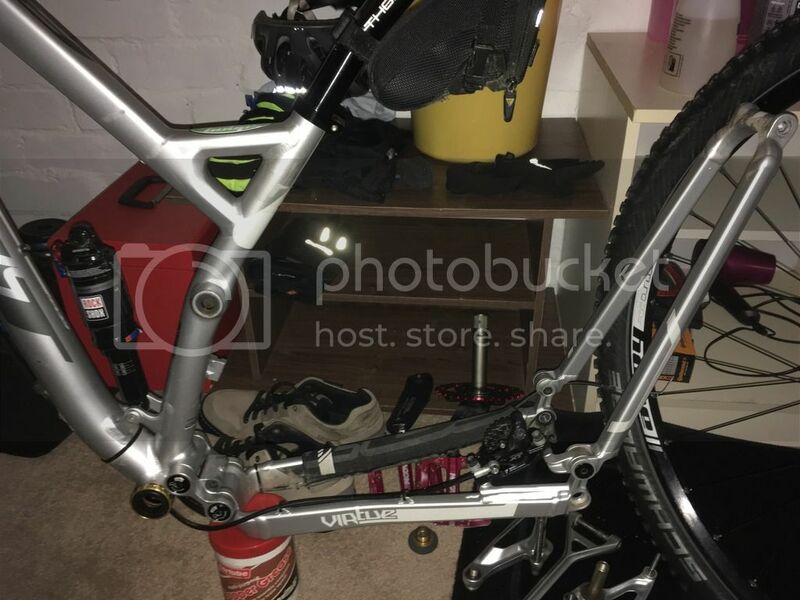 The work bike needs completely servicing next though, 4 years of to/from work daily means it's about kaputted, so just ordered new drivetrain, cables, tyres, brake blocks (rim), etc. I agree with Robmet though, a Torque Wrench is a very good investment. Bike is still riding great, but last ride I heard a creaking coming from one pedal, which went away after a few miles. So, after the ride, stripped it down but there was no way of getting the bearings in the pedal out ! Well, not without either a special tool, or risking damaging them by punching them out somehow. So, thought 'sod it' they have seen good service for 2 years, and looked at the different options for new pedals. I could not find anything in the same price range (under £45) that had the same size platform, stud length, and the build quality of my old ones. 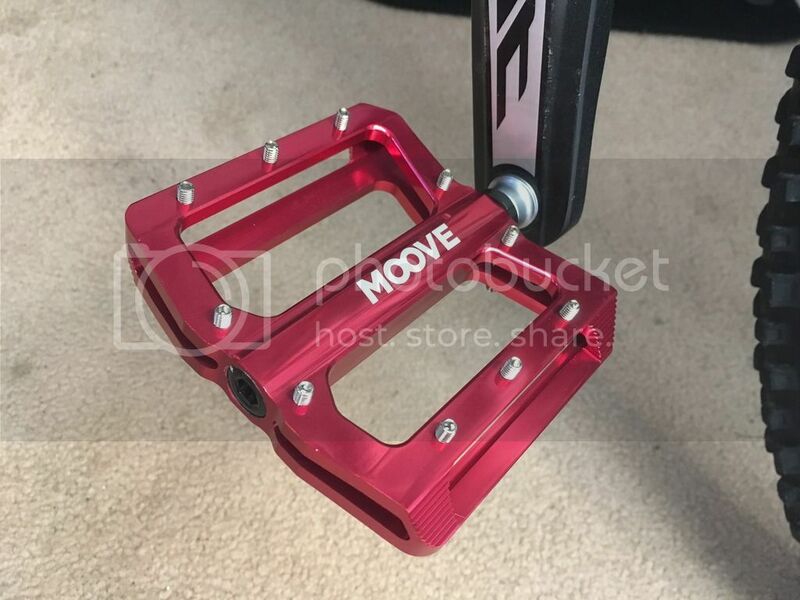 So, I bought another set of Moove Torque (better the devil you know hey). The only difference was, the new ones don't have thru-pins for the studs, but grub-pins instead, still the same length exposed though. As a nice bonus, they sent a FREE matching red anodised stem cap, I love a bit of bling lol (tart). If I were to buy a Felt,I would buy yours .No joke. It's probably the best looking one I have saw and my that's with my LBS being a stockist. Nice job and the touch of red really adds funkiness to it. Thanks bud, that is really nice of you to say so. I'm probably a bit OCD with it, but I do like it to be tip-top and I bloody hate any creaking or other noises lol ! It's just enabled me to put in my fastest time at Dalby today, 2hrs 7mins 19secs for the Red + 5 black sections.